I will grill pretty much anything. Especially when it starts to get warm and I don't want to turn on the oven. Plus some things just taste better from the grill. For me, pizza is one of these things. I don't have the money to build a beautiful stone pizza oven in my back yard. So I improvise. 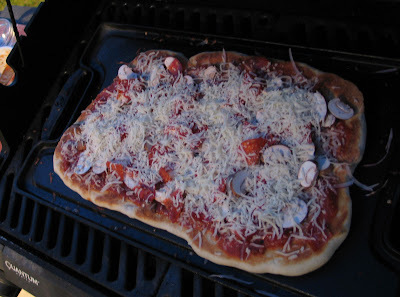 I make pizza on the gas barbecue. There is no real recipe for this. Just add what you like. I have made it right on the grill which works fine. You just have to watch it more to make sure the fireis not too high and the crust is not burning. I recently got a cast iron grill pan (Emeril brand, bought at Bed Bath and Beyond, in case you are looking for one). One side is ridged to give meats and veggies great grill marks, but solid so small stuff cannot slip through the grate. One side is solid, like a griddle. I used the solid side for the pizza. I made pizza last night. Here's what I used and what I did. I also have made pizza with no sauce and with white sauce, such as alfredo. toppings: use what you like. What did I use last night? OK. The pizza cooks fast. The trick is to have everything ready to go before you start the crust. Heat the grill to high and let it warm up. On a lightly floured surface, work the dough by handto stretch it to the size and shape that works for you. You can stretch it fairly thin, it will contract a bit when cooking. Mine are oblong since that is the shape of the griddle pan I have. Get all your ingredients set up near the grill so assembly is quick and easy. 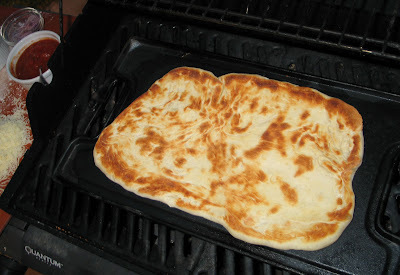 Put dough on griddle pan or grill (if cooking directly on grill, lower heat to medium). Close the grill and let crust cook, checking every couple minutes. Cook until crust is as done as you like it. 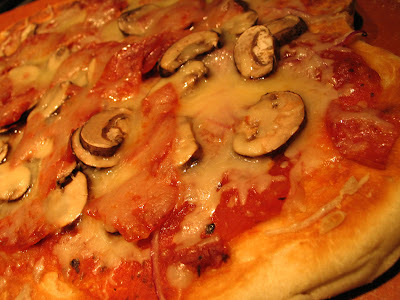 Remember, this is all about making the perfect pizza for you. Close the lid and cook until cheese is melted and bottom crust is as done as you like it. Once the pizza is done, remove it to a cutting board and let sit for a couple minutes. I added a touch of Parmesan and dried oregano to mine. Slice the veggies super thin. I use a ceramic blade slicer to make paper-thin slices. 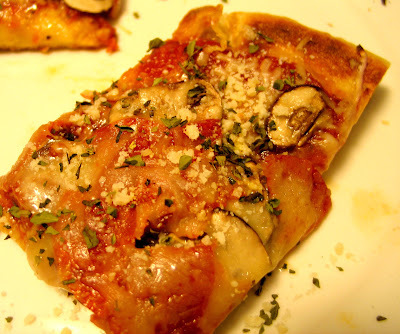 If you want chunkier veggies but are worried they won't cook quickly, because the pizza does come together in about 10-15 minutes from start to finish, give the veggies a quick sautee to start them softening. I do prefer the thinly sliced veggies. They keep their freshness and cook just fine in only a few minutes. Keep everything close at hand. 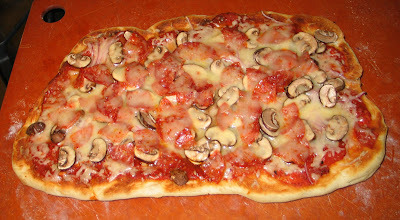 I had the mushrooms, onion, pepperoni and cheese on my cutting board in little piles and the sauce in a little bowl. 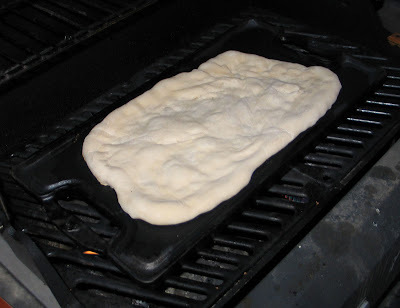 I used the same board to stretch and form the dough before cooking and then to remove the pizza when it was done. 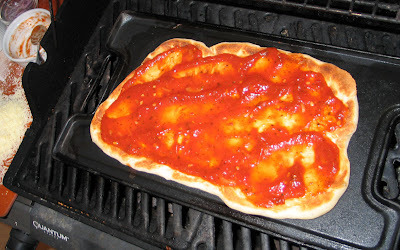 The easiest way to get the pizza off the grill and onto the board is to slide it off onto the board using a big spatula. If you have an extra set of hands to hold the board, even better. Experiment. Customize. Mostly, have fun. Yeah, yeah, yeah... It's just salad. and cheese and sour cream. even with the oil and cheese, probably at least a little healthier. And it's easy and looks great. Oh, and the anchovy paste in here does not make it taste fishy. It just gives it a little different saltiness than adding salt. 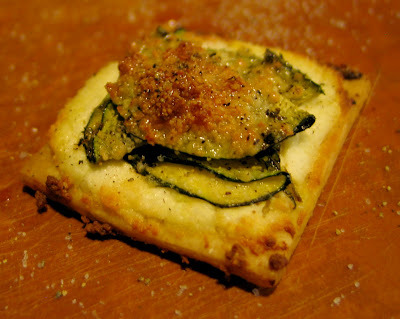 If the idea of anchovy paste skeevs you out, just omit it. If you think it needs to be saltier, just add a little sea salt to taste. anchovy paste and garlic in medium bowl. Whisk in blue cheese crumbles. but leave some pieces whole. To compose salad there are many options. and layer them on the plate (which is what I did). Rewhisk dressing just before adding to lettuce. Drizzle over lettuce and sprinkle with sliced onion. I think this would also be great with some bacon on it. Also some halved grape tomatoes would be tasty. Whatever you like would work. I kept this one simple and it was perfect. I also think you could use feta cheese if you don't like blue. It has been quite warm here the past few days. My plan, since I had four days off work, was to cook up a storm. But it is almost too hot to even think about cooking. At least cooking in the house. But Saturday was manfriend's birthday and he wanted chocolate-rum cake. 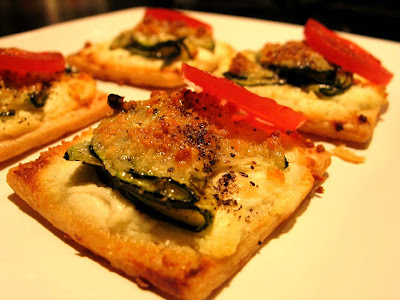 I figured since I already had the oven on for that I would try some mini zucchini and goat cheese tarts. I saw the recipe in the June 2008 issue of Bon Apetit. 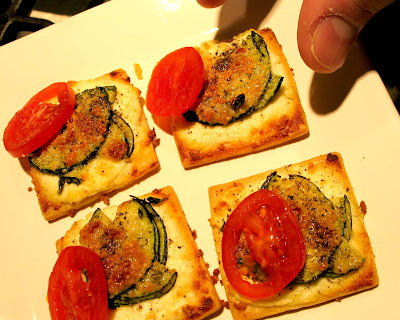 I really like goat cheese and these looked easy. The trick is that you use premade pie crusts for the tart crust. I think, since I am more likely to have puff pastry than pie crusts in my freezer that I will try them with puff pastry next time. And I would imagine you can use something other than the zucchini if you don't like that or don't have it. Maybe red peppers, mushrooms, a bit of sundried tomato... So many possibilities. Oh, and I did not make as many as this recipe calls for. I just made enough for me and the manfriend. That was four each. This recipe says it makes six servings, or 24 pieces. Line rimmed baking sheet with parchment paper. Place pie crust on floured surface. Using 1.5 to 1.75 inch cookie or biscuit cutter dipped in flour, cut out 24 pieces; transfer to prepared baking sheet, spacing 1/2 inch apart. Place in freezer until dough is firm, about 30 minutes. Toss sliced zucchini with salt and let sit 15 minutes. Drain, rinse and pat dry. Toss zucchini with 2 tablespoons olive oil and thyme; sprinkle with pepper. Spread goat cheese generously over each piece of dough. Fold 3-4 zucchini slices in half and place on goat cheese, making a flower-like or criss-cross pattern. Repeat until all pieces are assembled. Reserve any extra zucchini for another purpose. Bake until crusts are light golden, about 20 minutes. Drizzle lightly with olive oil. The recipe did not call for it, but I had some extra grape tomatoes. I sliced some up to add to the top of the tarts before serving. It gave it another flavor and a punch of color. manfriend was trying to sneak a taste. So it's not like I haven't cooked at all in the past month. I just haven't cooked anything very interesting or blog worthy. I've made various fish and chicken dishes. I wanted to do Mexican food. and those pickled spicy carrots. Here I will share the snapper recipe with you. 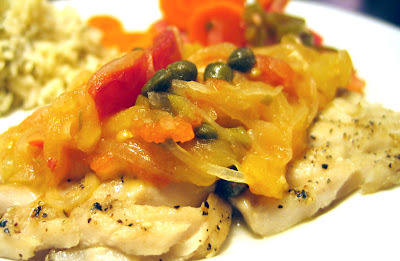 work just as well with halibut or tilapia or some other similar white fish. I think it would even be good with chicken. I skipped olives, which also go in this dish. The manfriend is not a fan of olives. 1/4 cup green olives, pitted and chopped. Salt and pepper the fish on both sides. add fish and cook a few minutes on each side. I tried to build up a crunchiness to it, hence the high heat. Once fish is done, remove from pan and cover. and add onions and garlic. Cook until soft. Add the wine and cook until it is reduced. (and olives if you like 'em) and bring to a boil. Cook until reduced and it starts to thicken. Reduce heat and add fish. Cook for 2 minutes. Serve fish with the onion/tomato mixture on top. 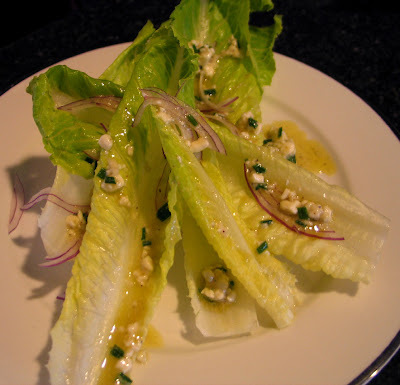 Garnish with lemon or lime wedges. This came out nice. It was pretty light. The sauce is meant to be redder than mine was. But I used red and yellow tomatoes. It still tasted good and I wanted to experiment with the yellows. For the green rice, just make your favorite type of white rice. When it is done, add in some of your favorite green salsa. I just do this to taste. I will post the carrot recipe separately in the next day or so. Does it count as talking to yourself if you call it a blog?